As part of a planned driver swap with Hendrick Motorsport’s Jimmie Johnson, the two-time Formula 1 World Champion has his first taste of the Chevrolet Camaro ZL1 Cup car. 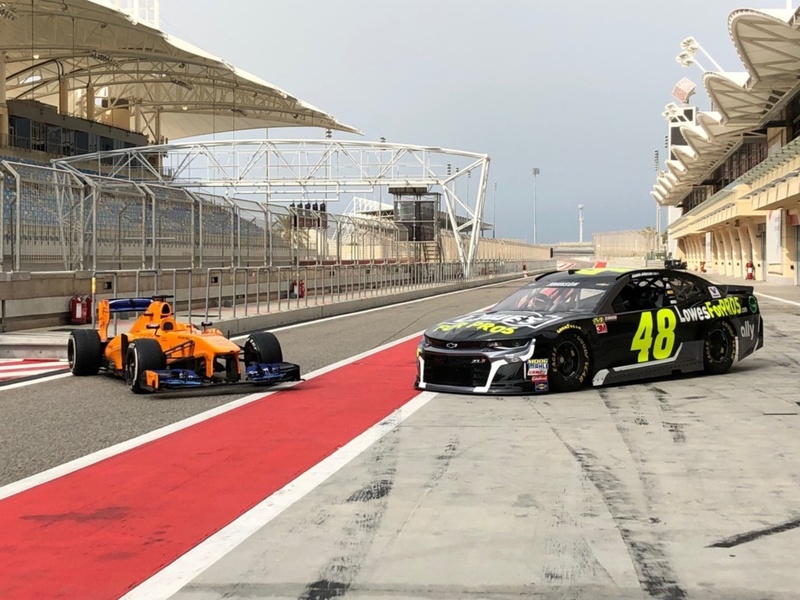 Following the conclusion of the 2018 F1 season in Abu Dhabi yesterday, the pair were on hand at the Bahrain International Circuit in order to sample each other’s rides. Alonso, is no stranger to American motorsports after his cameo in the 2017 Indianapolis 500, piloted Johnson’s No. 48 Hendrick Motorsports Chevrolet around the 3.363-mile Grand Prix circuit. Alan Gustafson who normally sits on the box for Johnson’s teammate, Chase Elliott, oversaw the preparation of the No. 48 Chevy for Monday’s event following the departure of Johnson’s longtime crew chief, Chad Knaus. Johnson, a seven-time Monster Energy NASCAR Cup Series champion in his own right was given his first taste of F1 in a 2012 McLaren-Mercedes following a few baseline laps laid down by Fernando. It was actually Johnson’s first ever outing in a single seater race car on a proper road course, and he seriously impressed Fernando Alonso with his ability to adapt. “Impressive,” said Alonso of Johnson’s performance. “I think he was really gaining time every run he was going out. This was actually the third time NASCAR and F1 drivers have swapped places, with Jeff Gordon and Juan Pablo Montoya trading rides in 2003 at Indianapolis, followed by a Lewis Hamilton and Tony Stewart crossover at Watkins Glen in 2011. Fernando Alonso has been cozying up with various GM racing teams, and has most recently been announced as a co-driver of the Wayne Taylor Racing No. 10 Cadillac DPi race car for the 24 Hours of Daytona in January 2019. Along with seat time in the 2018 Chevrolet Camaro ZL1 Cup car, Alonso has also done some testing for Andretti Autosport at Barber Motorsports Park. Andretti is rumored to switch from Honda to Chevrolet power units for the 2019 IndyCar season. Great Direction. Alonso is the man and Cadillac is my favorite Brand! !